Actually, it was not. 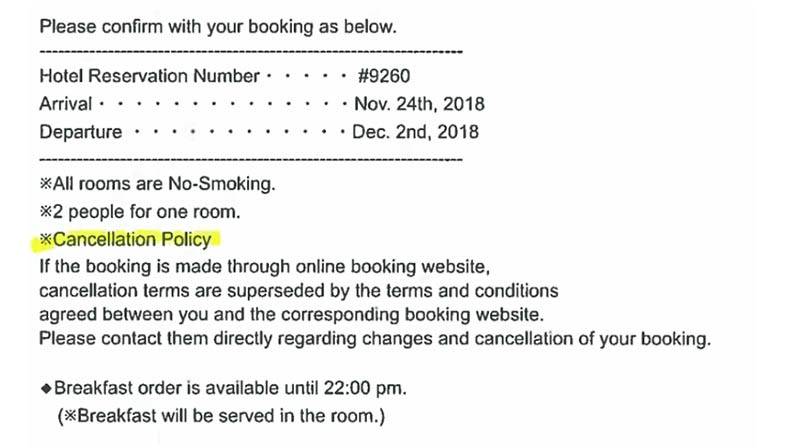 Kay’s case is painful but necessary reminder that when you’re self-booking, you must pay attention to the fine print and can make no assumptions — especially when it comes to the cancellation deadline. It turns out Kay was a little late and that made it difficult to help her. It did not, however, stop my advocacy team from trying. A room in Tokyo with a cancellation deadline. But is it in local time? Kay had booked a room at the Hotel Ryumeikan Tokyo through Orbitz. Let’s try that right now. The property lists “free cancellation” as one of its features. You have to click on the words to reveal the details. Kay made a reservation at the hotel from Nov. 24 to Dec. 2., for a total rate of $3,028. She had second thoughts about her travel plans and canceled by Oct. 26. But Orbitz kicked back her reservation as “nonrefundable” because she’d missed the cancellation deadline. Why did she miss the cancellation deadline? It’s never a good idea to cut it close when you’re dealing with a hotel cancellation, or any cancellation. But Kay was certain she hadn’t. But Orbitz saw things differently. Its deadline was Tokyo time, meaning she needed to cancel by Oct. 25 her time to get a “free” refund. Unsurprisingly, the hotel stood behind Orbitz. What can you do about a missed cancellation deadline? Kay sent a polite email to Orbitz, asking to have the cancellation fee reversed. She said Orbitz led her to believe the cancellation was in local time. In response, Orbitz offered her a credit at the same hotel. She might have appealed the denial to Orbitz (owned by Expedia), but she didn’t. Instead, she filed a chargeback with her credit card. It is both deceptive and fraudulent to advertise a cancellation policy as an enticement, but have a 100% fee. I read through the “fine print” and made very sure that I had the time right. On that item, they shiftily slipped in that it is the time of the hotel (Tokyo) and not the time of the purchaser, reducing the overall cancellation time. It is clearly bad business practices. I have used Orbitz for years and am very disappointed by this Internet research shows an excessive amount of complaints of fraud. There’s even a Facebook page of people victimized by their practices. Please support me in removing that $3,028 charge, protecting my consumer interest with using your credit card company and require Orbitz to have clear and fair practices. If they get away with charging me, it is an endorsement by your company to do this to consumers. In the enclosed paper trail, Kay shows screenshots of the fee as it appears to her. It isn’t clear when the screenshots were taken. When her credit card sided with Orbitz, Kay filed complaints with her state attorney general and the BBB. The results were also predictable: None. If we’d been able to reproduce Kay’s reservation, along with the deceptive notification, I would have been first to jump in and help her. But my team and I reviewed the documentation and the reservations and could not even find the smallest peg on which to hang our hats. It’s true, Orbitz’s disclosure is not the best. But if you have any questions about the time zone, you just have to click on the link for more information. Had Kay done that, she might have found a way to save $3,028. A cancel for any reason travel insurance policy would have helped, too. The policies, which cost about 10 percent of the cost of your trip, allow you to recover anywhere from 50 to 70 percent of the cost of your vacation if you decide to cancel. Given the circumstances of this request and the clear disclosure my advocacy team found, we declined to take this cancellation deadline case. Should we have taken Heather Kay's case?